In 1984 a miner’s strike was mounted England in an order to shut down the British coal industry as a whole and prevent the closure of unprofitable mines. 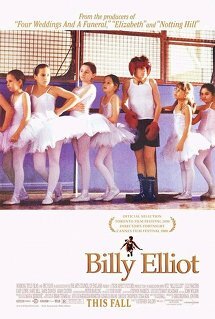 Against this backdrop Billy Elliot (Jamie Bell), the son and brother of striking coal miners, rejects the boxing his father (Gary Lewis) wants him to learn, and instead takes an interest in ballet. Much to the family’s chagrin, Billy excels at it and eventually lands an audition at the Royal Ballet School in London. No shock, but Billy’s father and brother come to rally around the boy’s ballet interest and, in the end, Billy is accepted into the school. Billy Elliot is a crowd pleaser. It doesn’t demand much of the audience in terms of wrestling with the economic realities of the striking miners, and the life of poverty during the strike, but instead focuses on Billy’s ballet interest. In that way, it exists on the same continuum as Rocky and The Karate Kid, and not on the kitchen-sink-realist-drama track. Which means it’s predictable as hell, gives the audience exactly what they think they should get, and so satisfies in that way. That said, don’t assume predictability makes the pleasures of Billy Elliot surface-level only. While there is an obvious formula at work, director Stephen Daldry carefully avoids treating the movie as rote – if it’s even possible to make a movie about a boy choosing ballet over boxing rote. Because of it, the movie is a very sweet story about the relationship between a father and son, their different ideas of masculinity, and the ultimate acceptance of the notion that just because a son wants to be different from his dad does not render the son’s desires invalid. In this way Billy’s story is the story of every son with an obtuse father. Daldry is best in working with the actors and at managing the tone of the film through them. Yes, on occasion he allows things to feel a bit broad, but that should be expected when the film is about a boy wanting to perform ballet, which can be an overly-broad medium in its own right. Beyond this, Daldry is attentive to the details: the way the father eventually is reduced to smoking hand-rolled cigarettes, presumably because the pre-made kind are out of the price range of a striking miner any longer. Or the way the boxing coach, who is also on strike from the mines, is quick to maintain his dignity by pointing out that while he does need the money he makes as a coach, he doesn’t do it for the actual money. Or the way Billy’s dad tears up in the same way any proud father would when he attends the opening night of Billy’s debut in an all-male version of The Black Swan. In those small moments you see the story truly colored in. In the end, Daldry is an unassuming director, who doesn’t really give us any, “Oh my god, that’s beautiful!” shots in the film, but still manages to give us something cinematic, and makes it feel earned. The first is earlier in the film, when Billy and a classmate from both the ballet class and regular school, are walking and talking, and dragging sticks along a brick wall as children will do. Well, when they come to a break in the wall and police with riot shields fill the gap – the miner’s strike is definitely violent and requires a police presence – they just carry on dragging their sticks across the shields until they reach the next wall. It was a small moment that was both funny and sad at the same time – funny because the police don’t react, but also sad because this sort of police presence seems so standard to the children they hardly notice it. The best sequence, though, is at the end, when the family is waiting on the letter to find out if Billy has been accepted into the school. When the letter comes Billy is not yet home and so the family sets it on the kitchen table and gathers around, waiting for him to return and open it. When Billy does return, rather than open it there he takes it into the next room and closes the door between them. The moment builds and builds as Billy opens the letter and finally sinks into a chair. The look on his face is delightfully ambiguous, ratcheting up the tension of the moment that is only broken when Billy finally reveals he’s gotten in. In all, Daldry plays the tension of the scene beautifully and, no matter what might be said about his later films, his work here is true. Usually the Better Than Best question is whether a Best Picture Also-Ran is actually better than the Best Picture winner. But as Billy Elliot was not nominated for Best Picture, that’s not on our plate. Still, I’ll say that Best Picture 2000 was Gladiator, a terrible film I mostly despise, so it’s no trick declaring Billy Elliot the superior film. That said, if we were really getting into the question, the true Best Picture of 2000 was probably Steven Soderbergh’s Traffic. But, because it was not Best Picture nominated we’re only left to compare the categories where Billy Elliot was nominated, then lost. Stephen Daldry was nominated for Best Director, the first of three for him, and while he elevates the material, he ultimately lost the Oscar to Stephen Soderbergh for Traffic. While Traffic might not be Soderbergh’s finest hour – you could honestly make a case that about a dozen other films by him are both better, and worse – he manages the divergent story-lines well, never panders, and gives us something exciting. There is no question he deserved the award. Julie Walters lost Best Supporting Actress to Marcia Gay Harden, for Pollock, and while both women are fine in their films, and each has nuance in their work, it’s hard to say Walters was better or worse than Harden. If either won, it would be fine. Of course, the true winner in the category should have been Frances McDormand for her turn as the mother in Almost Famous. That role seems to have a little bit of the schtick to it that McDormand likes to play around with, but at the same time the schtick is a necessary element of the character, a persona she adopts to protect herself from the eventual abandonment of her by her children that she senses is coming. Honestly, if people were to reevaluate the 2000 Best Supporting Actress race today, I think McDormand might walk away with this one, overtaking the at-the-time front-runner, Kate Hudson for Almost Famous, and the upset-winner, Harden. The screenplay for Almost Famous won Cameron Crowe his only Oscar to date, and relegated the screenplay of Billy Elliot to Also-Ran. 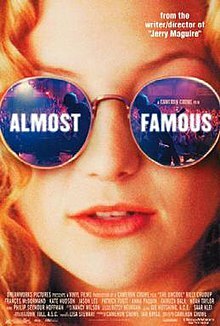 Say what you will about Crowe’s career since then – it’s been spotty, at best, and feels mostly unrooted from any of the personal feeling and honesty that characterized his films to that point – it’s hard to argue against the screenplay for Almost Famous being an all-timer. As an American, I’m not very well-versed in the labor history of English industries, so if I’ve gotten some of the details wrong here, excuse them as the broad strokes are right.